Rocky Mount, NC Bojangles'® Tands, INC. Store #41 - Bojangles'® / Tands, Inc.
Why go to just any old Rocky Mount, NC fast food joint when you can have the fresh, quality southern food from Bojangles’®? Rocky Mount customers love our flaky biscuits, flavorful sides and famous Cajun fried chicken. The Bojangles’® menu has all your cravings covered — from salads to sweets, for breakfast, lunch and dinner. When you need fast, quality food in Rock Mount, NC, it’s Bo Time! 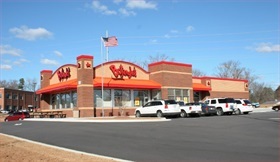 This Rocky Mount Bojangles’® is in an area that has seen a lot of recent development. Near Nash Health Care hospital and several doctors’ offices, this Bojangles’® is the perfect place for hospital workers, patients and their families to eat and spend time together.